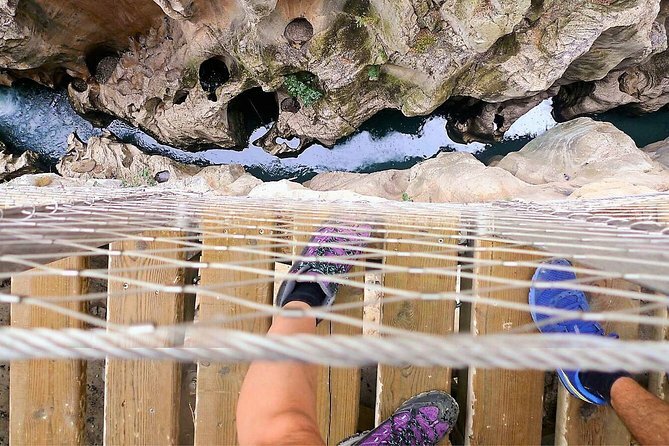 The Caminito del Rey is a cliff-side path hanging 100m above the waters of the river Guadalhorce reservoir, as it runs through the famous beauty spot; El Chorro Gorge, near the villages of El Chorro in Alora and, Ardales, about 25km inland from Malaga city. The 'new' Caminito del Rey was re-constructed and reopened to the public in 2015. The the route and design of the new path keeping as closely as possible to the old 1921 path. The famous boardwalk sections are constructed with wooded slatted transverse planks and a simple 1.2m-high three-wire guard rail. In places the path is only one metre wide, hanging to the cliff face. The 'old' path can be seen just below. A highlight is the steel suspension bridge with an open grid decking across the gorge, just next to the original emblematic aqueduct bridge. The path, originally built as workmen's access around 1905, was improved and opened to the public in 1921 by King Alfonso XXIII hence the name the Kings little path. By the 1980s the path had fallen into disrepair and was closed to the public. This did not stop the adventurous and the foolhardy and it became known as 'the most dangerous path in the world' or even the 'walk of death'. There were several fatal falls in the 1990s. A zip line was set up by local mountaineers in the 2000s to help those that continued to walk the path and there were more fatal falls. The authorities had promised many times to restore the path, it was finally undertaken and reopened on on 28 March 2015. In total the path is 8.1 km long and takes at least 3 hour to walk, however you need to allow four to five hours in total to complete the circuit. The path is divided into five sections; a 2.5 km access path from El Kiosko through the forest to the ticket entrance, a 1.3 km boardwalk through the Desfiladero de los Gaitanes (Gaitanes Gorge), a 1.6 km path through the wooded Valle del Hoyo (Hoyo valley), a 0.9 km cliff-hanging board through the Garganta del Chorro (Chorro gorge - litteraly throat of Chorro), finally a 1.8km access path to El Chorro village. (See detailed route description). 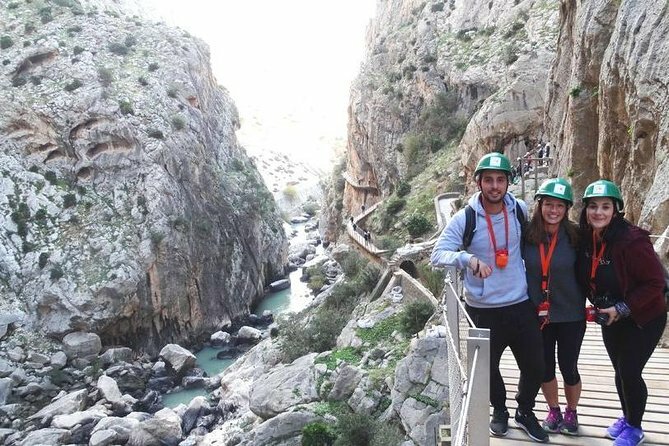 Caminito del Rey private tour for just you and your party with knowledgeable guide. Pick up from established Costa del Sol Hotels, travel to start of path and collection from exit. Everyday except Mondays. 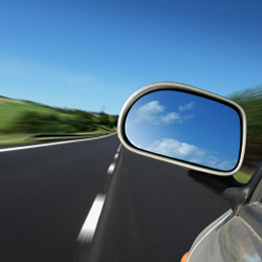 Hotel pick-up on Costa del Sol from Puerto Banus to Malaga 09,00 hrs. Price from 79 € pp (for nine). Caminito del Rey private tour for just you and your party with knowledgeable guide. Pick up from Seville city Hotels, travel to start of path and collection from exit. Everyday except Mondays. Hotel pick up in Seville 10,00 hrs - Price from 147€ pp (for six). No children permitted under 8 yrs of age. Rock climbers may still access the area at any time and must register and show their climbing insurance at the information offices. Tickets online cost is 10€ per person (including IVA) or 11,55€ including the optional shuttle bus to take you back to the starting point. You can also pay the bus driver on the day. When booking you must choose a start time (see opening hours above) in half hour intervals. Tickets are currently released up to end of March 2020. 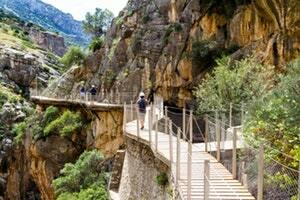 Due to the walk's popularity it is difficult to obtain last minute Caminito del Rey tickets. Most times are booked out about a month in advance. Tour providers have a separate allocation and may have different availability. Some local business and hotels have a ticket allocation. Whilst officially tickets must be purchased in advance, there are stand-by oportunities. Ticketless visitors waiting at the entrance barrier to the path (at the end of the 2.5km acess path which started at El Kiosko) will be called forward IF there are no shows and the 100 visitor per half hour allowance is not used.So if you are not a large group, and are prepared to wait, you will most likely be able walk the path. RENFE, the train company has an allocation of 100 tickets a day including train travel from any Malaga Cercanias C1 or C2 station to El Chorro station. That is 70 tickets without guide for 23€ and 30 tickets with guide for 31€. No online or pre-booking sales. Purchase ticket on the day from any Malaga Cercanias station ticket machine or ticket office. See getting to Caminito del Rey by train. When you reserve your ticket on line it clearly states the date (Fecha), and start time (Hora de Entrada). You will need to report to the path information office at this time. This is located at the end of the 2.5 km access path which started at El Kiosko or at the end of the 1.5 km access road which started at El Mirador Restaurant.) We suggest you arrive at the barrier 15 minutes early. Since you need to walk half an hour to get here, and find a place to park the car, and make a bathroom visit, aim to arrive at El Chorro at least one hour before your reserved time. Read about getting to Caminito del Rey. There will probably be a crowd of eager walkers at the barrier and the scene is a little chaotic. The attendant will call walkers through according to the time on the ticket and scan the ticket. One hundred reservations will have the same hour or half hour time, so walkers will be called through in two or three batches. Walkers who booked a guided tour will be called through separately. After the ticket holders have entered, IF there are no-show spaces non ticket holders will be invited to proceed to the ticket office. It's advisable to make use of the toilets here, since there are NO toilet facilities on the path. There is a vending machine to purchase water and soft drinks. Do so if you do not have one litre of water per person, there are NO drinking water opportunities on the path. You will be issued with an optional hair net (for hygiene from the multi-use helmet) and compulsory safety helmet with chin strap. Guided tour walker wear green helmets, ticket only walker wear white helmets, and staff wear orange helmets. The supervisor explains some safety rules quickly in Spanish (and English if requested). These are; no smoking, no large bags or tripods, no umbrellas, no shouting, no litter, no human ashes scattering, helmets must be worn at all times, Then walkers set off at their own pace, no need to keep in a group.